If you are a grown man with style who likes to go to parties and dresses only with style. You are just the man who likes to be seen wearing a walking suit. The walking suit is more than a shirt and pair of pants to match but a fashion statement of style for the grown man who knows how to dress. 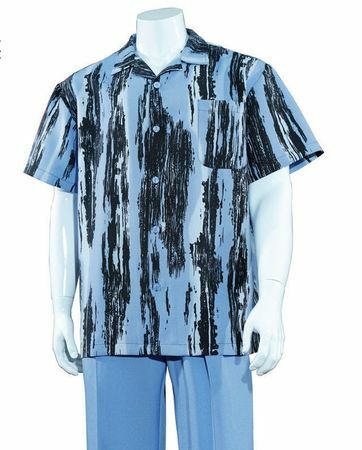 This short sleeve walking suit has a light blue brush pattern shirt with matching solid light blue pants with pleats. Made of poly fabric.